Are you ready to begin year curriculum mapping and planning for next school year? Let’s get started! In Part One I mentioned the importance of being the expert of your grade level standards. Thorough understanding of what is required will help simplify your direction and ensure your kiddos are getting exactly what they need to not only be successful in your classroom, but in the following grade levels as well. The importance of not only knowing your standards, but the standards of the grade level – maybe even levels – that follow cannot be ignored. Make sure you totally understand the expectation. This will make it much easier to plan out your strategies for teaching and assessing mastery of those skills. Ok… so you know your standards. Now, unpack them. Some are very cut and dry. Simplistic in nature. Nothing to worry about there. No extra time to be spent. However, some are multifaceted. In those cases, aspects of the standards will be addressed, even mastered, during the first part of the year. However, the standard as a whole, may not be mastered until the end of the year. Unpacking the standards helps you take them apart and figure out which elements should be placed where. Take a glance at first grade CCSS standard L.1.1j. In the beginning of the year, it is quite sensical to expect our little 6-ish year olds to produce a complete simple sentence. Around the third month or so, they probably could do an interrogative sentence most of the time. The expectation that students could master both exclamatory and interrogative with mastery by the end of the second trimester is very fair. Those compound declarative and imperative sentences however, will need to wait until the third part of the school year. Unpacking that standard into its components and then figuring out where those different components fit rationally, is vital to accurate and effective year curriculum mapping and planning. Keep in mind, these standards are end of the year expectations. You must keep this point clear. This is often lost in district plans, assessment calendars and curriculum. It needs to be at the forefront when determining what is guiding your instruction. This is where backwards planning comes into play. You must always ask, what is the ultimate goal? How will we get there? Where do I place the stepping-stones? ☑Know grade level standards and how mastery of those standards affect the following grade levels. ☑Unpacked multifaceted standards, delineating what time of year each aspect is best suited. It’s time to start backwards planning! If a business sets a goal to end their fiscal year at $30 million in sales, they backwards plan how they will get there. They take a look at that end goal and determine what they will need to do to make that happen. They take into account past practices, both failures and successes. Looking at the BIG PICTURE is necessary. Backwards planning just makes sense and most people do it – a lot in a great majority of aspects in their lives. Spontaneity is fabulous. But is isn’t sustainable, nor effective 24/7. Start with a grid noting all of the standards. In each box note which assignments or lessons you do that tackle and/or assess that standard in that grading period. Note any mandated district assessments for that standard as well. If it is mandated, you MUST put priority to covering that standard effectively prior to that assessment date. Denote trimesters where that standard may not be appropriate (gray boxes shown). Generally this is a timing thing. Either the concept is difficult for early in the year, or too easy for later in the year. Start with the end goal. The last trimester. The most complicated standards or objectives and step your way to the beginning of the year with that standard. The is the “How will we get there?” step. This ELA Data Log indicates where I will assess each standard. I also have columns to track individual student progress toward mastery. B=below A=Approaching standard M=Mastery. This type of tracking is a very good way to keep data that not only gives you information about each student, but also helps guide instruction. In those ELA sample pages above I noted district assessments in red. As you can see, I do not have adequate assessments from the district, so I need to pull from my resources. That’s not a problem. You can use nearly ANYTHING that addresses the standard as an assessment. Maybe it’s something you’ve done for years, but you’ve never actually graded it. Start grading it. Maybe it’s something you will have the kids do on a simple blank journal page. Plan AHEAD to have something to teach, progress monitor and assess for each standard. It doesn’t have to be lengthy – just accurate to the standard. The standards noted in blue are ones that the curriculum provided by my provided curriculum does not cover adequately. I have marked it in blue to be sure that I create more substantial lessons to ensure student mastery of the skills. Click here to download the completed maps I use in my classroom. These Standards Mapping and Mastery Data Tracking logs are a BONUS component in both the Ultimate Year Planner and Year and Weekly planner Bundles! They are included for all CCSS ELA and Math for grades K-6! Teachers are often given scopes and sequences with curriculum or from their districts that are difficult to follow or do not mix well with the order they like to teach. It is important that teachers address curriculum in a way that meshes well with everything in the classroom. Make your curriculum work for you, don’t try to work around a clunky scope and sequence. The bottom line: You determine the flow of the standards throughout the year and pull from various places to match that flow. Try not to jump around – forcing things to fit – simply because they are cute or fit your “theme”. Year curriculum mapping and planning works best with the standards focus is clear and concise each day/week/month. This Scope and Sequence is included in the Homework Time resources. The point here is, taking a bit from curriculum A, assessment B, worksheet C, and game/word work activity D will not be seamless unless they are all focused on the same standard or concept. CONSISTENCY is KEY! Our goal is mastery. The kiddos need to be fully immersed in the concept. Ultimately, mapping out your standards for the year will help ensure you maintain consistency in your instruction while focusing on each and every standard. Some scopes and curriculum maps will have to change to better suit the flow of everything else in your classroom. Come back tomorrow for the final part in this series! I’ll discuss putting it all together in a BIG PICTURE and bringing total cohesion to your school year. 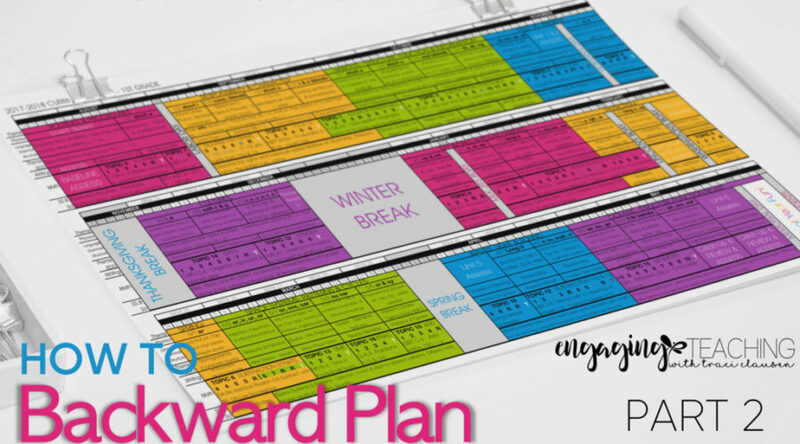 **If you’d like to start using the year curriculum planning template I use, click HERE. There are a variety of editable templates. Change the colors and fonts as you wish. I will go into more detail about it in Part 3. A Year Plan for 2014-2015, Already? !